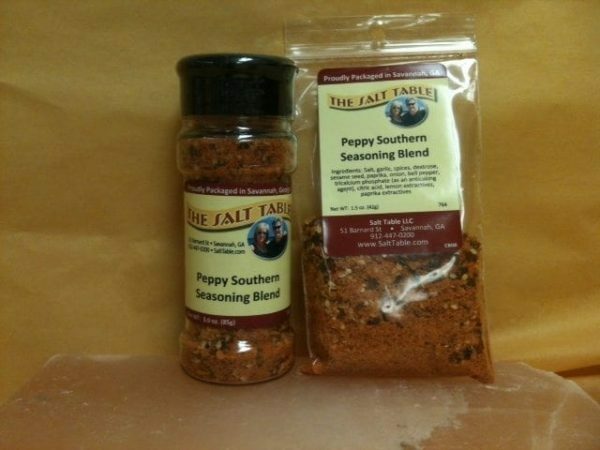 We love this salt seasoning blend that combines garlic, paprika, onion, spices and some lemon, and adds in some sesame seeds for a truly great taste. Add it to your flour to do fried chicken or fish, or just use it as a rub. It’s got just a slight kick, hence “peppy”. It’s just good. Enjoy! Ingredients: Salt, garlic, spices, dextrose, sesame seed, paprika, onion, bell pepper, tricalcium phosphate(as an anticaking agent), citric acid, lemon and paprika extractives.